Saving our client time, staffing and money even without a plan to work to! 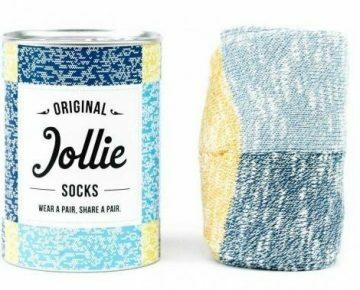 Ed Vickers founded Jollie Goods to find a sustainable solution that provides socks to homeless charities and engages people with a fun opportunity to support them. For every pair of Jollie Socks bought, Jollie Goods donates a pair to charity. 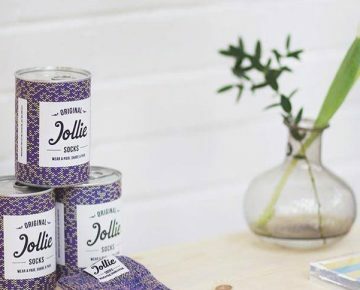 Jollie Goods needed us to take care of a process: managing the fulfilment, stock control and mailing of their Jollie Socks to individual customers and replenishment to their main retailer, John Lewis. As well as printing labels the job involves packing socks into tins, attaching labels, storing stock, picking and packing on demand for individual customers and posting their orders directly, and delivering bulk orders to John Lewis. There are a number of elements to juggle as orders come in randomly from customers and deliveries to John Lewis are ad hoc. We can establish timescales for fulfilling orders but cannot fix a schedule or plan workload in advance. Find an efficient, sustainable and cost-effective way to manage the process of printing, fulfilment and mailing. Manage coordination of individual orders from customers on demand with sizeable, unscheduled, ad hoc deliveries to John Lewis. Maintaining a supply and working without being able to plan workload! We maintain a sufficient supply of stock ready to go whilst being ready to respond to an increase in orders. Being flexible is essential. Many tasks are completed by hand so balancing staffing levels effectively to manage stock and meet orders whilst not over resourcing is key. We provide the whole package and take care of everything making it hassle-free for Jollie Goods. Our all-inclusive service saves them time, staffing and money.